The Electric Eel or Electrophorus electricus is an amazing fish that has the ability to discharge a burst of over 600 volts when threatened or while hunting its dinner. These freshwater fish is known as Poraque in Brazil and can grow over 8' in length and weigh in at over 45lbs! 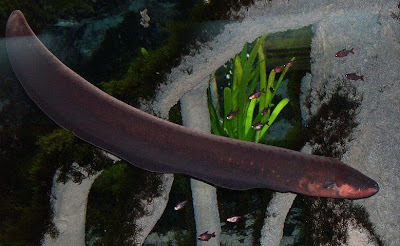 While human deaths are very rare, they have been reported from this dangerous eel. Normally, this occurs by heart failure from the extreme shock that the Electric Eel sends out through the water. This fish's eyesight is very weak, but it makes up for this by using a low voltage pulse, almost like sonar to find its prey. They can live up to 15 years and feed on fish and small mammals. 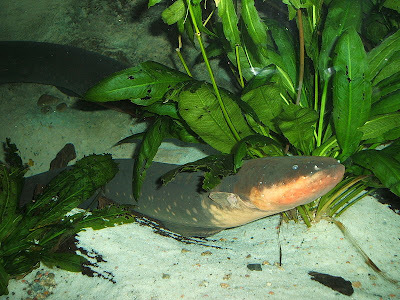 Despite its name the Electric Eels in not really an Eel at all. By scientific classification is it closer to a Knifefish! They can be kept in an aquarium as a pet for the die hard fish fan that doesn't mind risking his or her life. In the wild they are found in the Amazon River and other places in South America.